WordConvs is flexible system for text conversion and formatting. 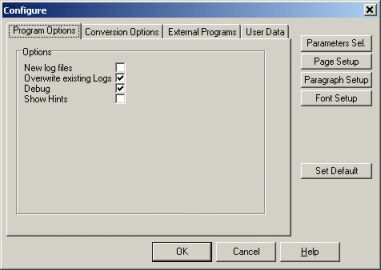 It uses the text converters included in Microsoft Word 8.0 or higher to convert files written by other word processors. This version works with the new Word 2007 as well, which allows conversion to PDF. 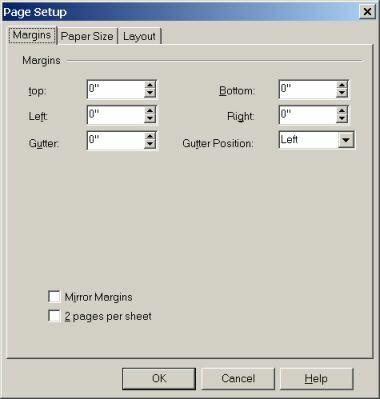 Moreover the program lets you change the document setting (like page with, page height, margins etc, that is nearly all the parameters used by MsWord). So you can utilize it also to standardize in one run a batch of documents written with different parameters. In that case the conversion step can be skipped if not needed. to standardize your documents reformatting them as the conversion step can be skipped. to process easily and quickly a big number of documents in one step. 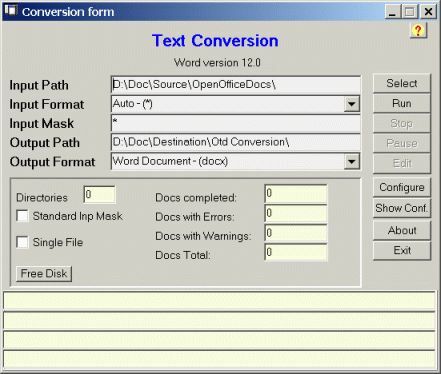 WordConvs uses Microsoft Word and its converters¹ to convert from and to the available input and output formats. It allows also the use of an external converter program, like OdfConverterTest.exe², which allows to convert Open Office documents (.odt) to MS Word documents, or any other you have and you prefer to use. 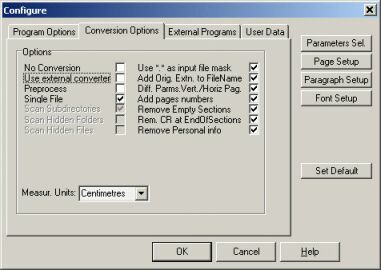 This option can be useful if a conversion program doesn't have batch capability or doesn't allow to scan subdirectories or/and to process hidden files and folders, as WordConvs gives these functionalities. It can be useful also if there is not an included mechanism to test the completeness of the conversion, as some converters in case of errors in input file truncate the conversion without any kind of indication of the fact. In case of processing of a large number of file this can be dangerous as you believe that the results are good while you can have as result some truncated document (only partially converted). To test, also if not in a secure way, this case, a program has been inserted which count the words, lines, and characters of the input document. As Microsoft Word has internally the possibility to count them in the output document, it is possible to compare these counters. Naturally the input file counters are only a row approximation as only managing the formatting of the input document it is possible to have a good count. The WC.EXE³ program included in the setup, is a general program (valid for document written by every word processor) but with a variable level of accuracy of the result, depending on the format of the document. For this reason the possibility to set the threshold of percent difference that give rise to a warning message, has been inserted, as well as the possibility to choose which of the 3 counters (word, lines, characters) to use (they can be used alone or in whichever mix). If a more accurate program is available to you, you can use it by setting its filename in the reserved space on the configuration dialog, as well as the 3 possible strings forming the input line command together with input and output file names set by WordConvs. NOTE: When using WordConvs to convert a large number of files take care that the operation is rather slow. To convert ten thousand files on a Pentium V 2.4 GHz. with 512 MB of memory took about 8 hours. One solution in this case is letting the computer make the job during the night hours as WordConvs never stops in case of errors, there is no blocking message and when the job is finished it is possible to control the results on the 3 log files produced: ConvLog.txt, ErrorLog.txt, WarnsLog.txt. You can choose which parameters to modify in the converted document (all the unselected parameters remain unchanged). 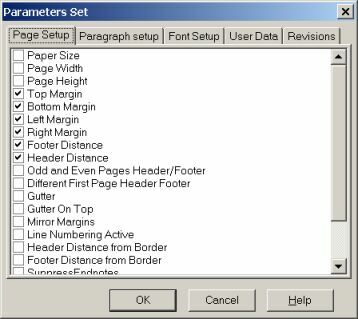 Three dialogs (page, paragraph and font setup), very similar to that used by MsWord allow to set the values of the parameters. These values are used only if the corresponding checkboxes in the Parameters Set dialog are checked. In batch conversion (multiple file processing) mode, formatting functions are disabled and only documents smaller then 50 kb can be processed. In Single File Conversion mode, the conversion function is disabled and and only documents smaller then 25 kb can be processed and the output file name is always TEST.DOC, independently form input file name. You can get it from the Download page and to register it from the Registration page from which different order forms are selectable to place an order. The beta version beta 1.0.2.11 is now availabe. Fixed the problem with log file when input and output folder coincide and the subtree traverse option is active. Some minor changes on the presentation. V1.0.2.10 July 20, 2006 Correction of syntax of output file Index.html. V1.0.2.11 Beta Version September 20, 2008 Added the possibility to keep the original file date, file attributes, security settings. ¹ To load or update the converters of Microsoft Word follow this link. ² OdfConverterTest.exe is available from sourceforge site.